With eight tips, hole sizes of .30, .50, .70, 1.15, 1.50, 1.70 millimeters, and a holder, now you will always have the right size hand setter. 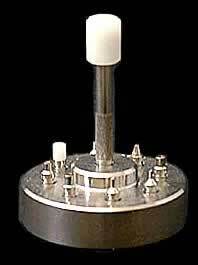 Nickel-plated base, Ø 50 mm. Movement holder for supporting the center wheel shaft while attaching hands. The top plate is engraved with circles to help center the movement on the rest rod. The rest rod is sustained by a spring and adjusts to the required height automatically. 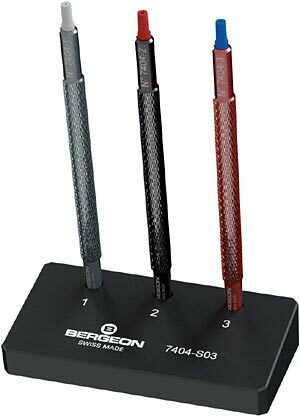 Set of three new double ended hand setting tools, Bergeon Swiss made. Contains 7404-1 (0.50 mm x 1.0 mm), 7404-2 (0.80 mm x 1.50 mm) and 7404-3 (center pointing x flat tip). Set of three new double ended hand setting tools, Bergeon Swiss made. Contains 7404-1 (0.50 mm x 1.0 mm), 7404-2 (0.80 mm x 1.50 mm) and 7404-3 (center pointing x flat tip). Comes with a weighted stand to hold the tools when not in use. Recommended for the smaller hands on quartz watches. Double sided, on one end the diameter of the hole is 0.50 mm and the other end is 1.00 mm. If you have tried to put on quartz hands without this tool you know how hard that can be. This tool is a lifesaver and a timesaver and will also help with hole sizes as large as 1.5 mm. Made for larger hands on both mechanical movements and chronograph quartz watches. Double sided, on one end the diameter of the hole is 0.80 mm and the other end is 1.50 mm. 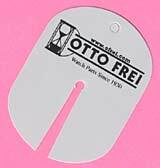 This tool is a lifesaver and a timesaver and will also help with hole sizes smaller and larger than the listed sizes. Double sided, on one end is blue pvc with center pointing and flat tip made in brass on the other end. Set of 4 special knurled handle hand setting tools with rotating heads. The special knurled handle provides a better grip and the rotating head helps index the hand better during installation. Hole diameter sizes 0.6, 1.2, 1.6 mm and no hole. The exterior diameter of the tip is 1.50 mm Comes with a weighted stand to hold the tools when not in use. Horotec hand setting tool with 0.5mm hole on one side and 1.0mm hole on the other. Knurled aluminium handle with delrin driven stakes. Horotec hand setting tool with 0.8mm on one side and no hole on the other. Knurled aluminium handle with delrin driven stakes. 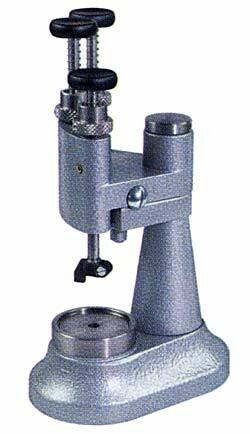 Horotec hand setting tool with 1.5 mm hole on one side and 2.0 mm hole on the other. Knurled aluminium handle with delrin driven stakes. Horotec hand setting tool with 0.65 mm hole on one side and 1.10 mm hole on the other. Knurled aluminium handle with delrin driven stakes. Set includes MSA-05.010 (0.5/1.0mm), MSA-05.011 (0.80mm/no hole), MSA-05.012 (1.5/2.0mm), and MSA-05.019 (0.65/1.10mm). Set comes with bit holder, 8 different sized tips, and a rotating stand to keep everything organized. Tip sizes include: Hole diameter/Exterior diameter - 0.00/2.00, 0.30/2.50, 0.80/2.60, 0.95/2.80, 1.10/2.90, 1.35/3.00, 1.50/3.2, 2.10/3.50. This replacement plunger & spring is for the older version of the MSA05.015. If your bits are press in, then this the correct plunger for your tool. 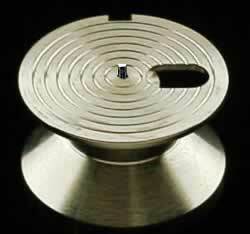 If your plunger uses the screw in bits, then you will need the MSA05.017 plunger and spring. Hand fitting press for wrist and pocket watches. Delivered with 8 different nylon screw on stakes stored on the press, spring-loaded for easy use. Equipped with plunger, spring, and screw on stake sizes: 0.50mm, 0.70mm, 0.90mm, 1.20mm, 1.50mm, 1.70, flat, and conical. 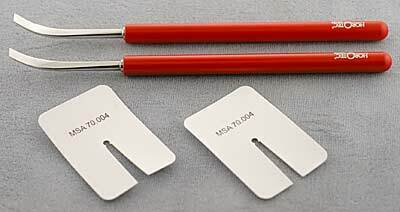 Stakes are the same ones used in MSA05.017. Product size: 70mm x 70mm x 105mm. Reduce hand-setting time with this hand setter by inserting different tips on each one of the plungers. Install the hour hand with one plunger, the minute hand with the second, and the second hand with the third. 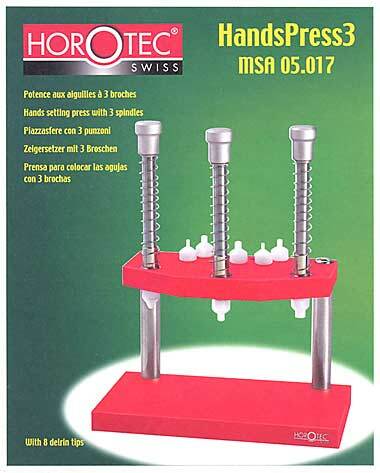 Horotec triple hand setter comes with 3 plungers, eight different nylon hand dies and plugs, is spring-loaded and easy to use. Uses the same plunger and spring as the MSA-05.015. Plunger only. 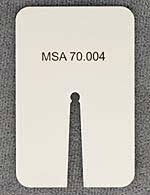 This plunger also works for the newer version of the MSA05.015 and MSA05.021. The bits are screwed in to the plunger and are not pressed in. Nylon hand dies available in 0.50, 0.70, 0.90, 1.20, 1.50, and 1.70 mm. Medium Watch & Pocket Hands. 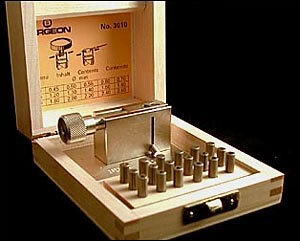 Bergeon tool for tightening crown, case and hand tubes. This is the correct way to tighten any tubes between 0.40 to 2.60 millimeters. In wooden case. With 18 interchangeable collets and 1 lever. The pipes are tightened evenly over their entire circumference. This ensures that they fit firmly and evenly on the hand arbor or crown. 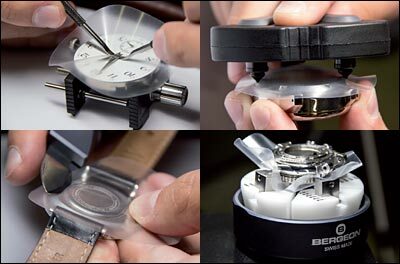 The Bergeon universal protection sheet can be used in many ways to protect your watch during repairs. Due to the flexibility and durability of the sheet, the sheet can be placed on top of the hands during removal to protect the dial and hands. The sheet can also be placed on the case back to prevent scratching by the case opener. Diameter of the sheet is 60mm. Swiss made. 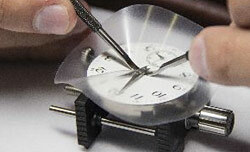 The Bergeon universal protection sheet can be used in many ways to protect your watch during repairs. Due to the flexibility and durability of the sheet, the sheet can be placed on top of the hands during removal to protect the dial and hands. The sheet can also be placed on the case back to prevent scratching by the case opener. Diameter of the sheet is 85mm. Swiss made. 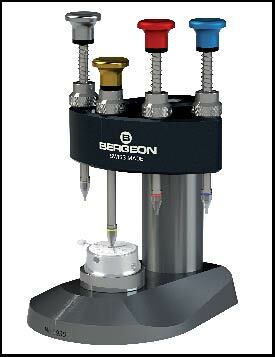 When having the best tools possible really count only this new hand setter from Bergeon will do. Set comes with 4 color coded bit holders and 4 color coded hand setting bits (Bit outer diameter/Hole diameter - 2.60mm/1.6mm, 2.10mm/1.20mm, 1.70mm/0.60mm, 1.50mm/No hole.) Movement holder is sold separately. Movement holders with a base diameter of 31mm will work on this hand setting tool. 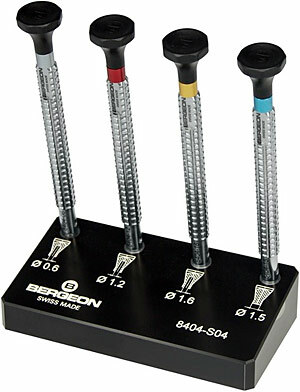 Click here for the Bergeon 1996 movement holder that will fit the 8935 hand setting tool. 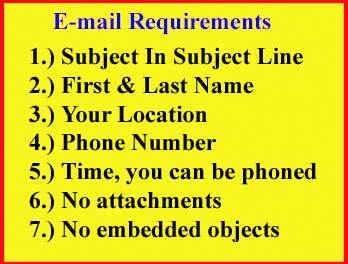 Special order item, please allow 4-6 weeks for delivery. Credit Card are not billed for special order items until they are shipped. Set comes with 4 bit holders and 4 hand setting bits (Hole diameter - 2.10, 1.35, 0.95, 0.30 mm) Movement holder is sold separately. Movement holders with a base diameter of 31mm will work on this hand setting tool. 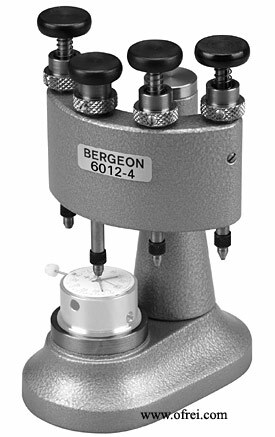 Click here for the Bergeon 1996 movement holder that will fit the 6012-4 hand setting tool. This Swiss Made tool features 3 stakes with steep tip for precise hand setting. 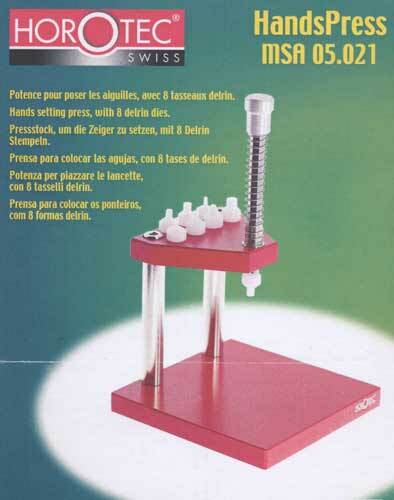 High precision hands fitting press with revolving head to avoid changing broaches. 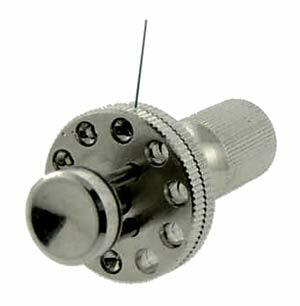 Each broach is equipped with a knurled nut for fine height adjustment. The tool holder swivels and snaps in place for perfect alignment. For use on hour, minute and decentred second hands. 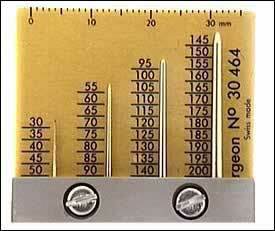 Bergeon hand gauge hole sizes .30 to 2.0 mm. Swiss made.